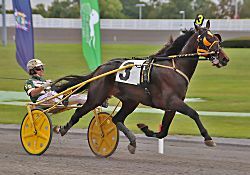 Goshen, NY — Michelle and Albert Crawford have announced that their world champion trotter Crazy Wow 3,1:51.1 ($2,532,143) has been retired and will stand stud in New York for an introductory fee of $3,000. An outstanding individual and multiple stakes winner of more than $2.5 million, Crazy Wow is the obvious choice for New York breeders as the next descendant of the unrivaled Credit Winner. His dam, No Pan No Gain (by Mr Vic, a son of the immortal Valley Victory), was a multiple stakes winner who earned $415,000 racing against the top fillies on the Grand Circuit, defeating Nova 2-year-old Trotting Filly of the Year in 2000, Spellbound Hanover. These bloodlines make Crazy Wow a great cross with Muscle Hill, Conway Hall and Chapter Seven mares. Making money the hard way, Crazy Wow won 22 of 67 starts in five seasons, racing against and defeating some of the toughest and fastest trotters in recent memory. This September the son of Crazed captured the $500,000 Maple Leaf Trot at Mohawk over Marion Marauder, Ariana G and Emoticon Hanover, equaling his mark of 1:51.1. Last season Crazy Wow established a world record of 1:52.3h winning the $185,000 Cleveland Trotting Classic over Resolve and Obrigado. In addition, he won the $200,000 Charlie Hill at Scioto in a track record 1:52f and the $150,000 Maxie Lee Invitational at Harrah’s Philadelphia over JL Cruze. He capped off the 2017 season with victory in the $250,000 Harry Harvey at Yonkers over 1-1/4 miles. Crazy Wow then won his elimination of the Breeders Crown at Hoosier, and was a fast closing second to Horse of the Year Hannelore Hanover in the $526,000 Open Trot final, earning just under $700,000 on the year. Crazy Wow has been so consistent for so long, that it is easy to forget that he won nine of 17 races and more than $1 million back in 2015 at age three. Winning the $270,000 Erskine over Trotter of the Year Pinkman and the now-fastest-trotter-ever Homicide Hunter, and the $243,550 Matron at the end of the season, he also captured a division of the Bluegrass at Red Mile. Crazy Wow was good, and tough, all season at three, while also copping the $500,000 Colonial in August (over Pinkman at Pocono) and setting a track record of 1:51.1 in the $255,000 Empire Breeders Classic at Vernon in June. Crazy Wow was also the champion 2-year-old trotting colt of the New York Sire Stakes program in 2014, winning two legs and the $225,000 final at Yonkers.This impressive effort led him to be purchased by a group led by Gene Kurzrok and sent to Burke Racing at the end of his freshman season. From an impressive and ever-expanding broodmare band, the Crawfords plan on supporting Crazy Wow with some of their top trotting mares. The marketing and management of Crazy Wow’s stallion career will also be administered by Crawford Farms. All breeding and booking inquiries should be directed to David Hanson at the Leatherstocking Equine Group, New Berlin, N.Y. Email: dhanson@leatherstockingvet.com or call 607.847.9996.